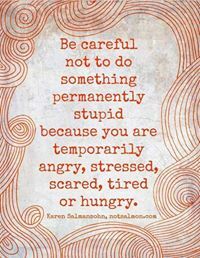 Today, I want to talk about the long term consequences of supporting short term negative behavior. 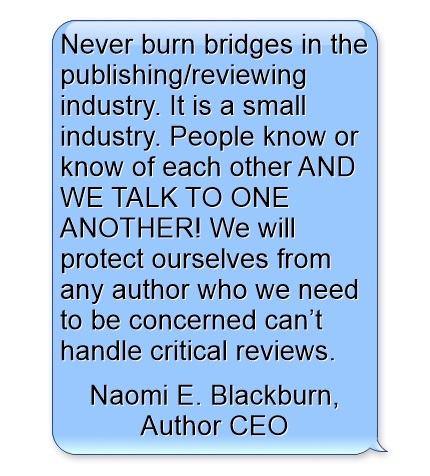 I was so shocked by not only the recent stalking incidents by two authors of negative reviewers, but support by some in indie publishing, of that said behavior. I am sure all of you are aware of the Kathleen Hale incident that involved the stalking of a negative book reviewer. I don’t want to rehash or focus on that today. 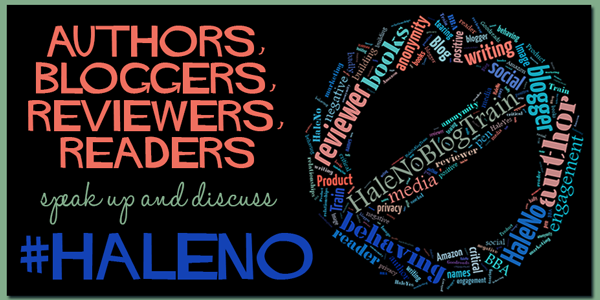 I do want to focus on those authors who came out in support of Ms. Hale’s behaviors and the long term consequences when authors support not only unacceptable behavior, but dangerous behaviors. When I first came into healthcare during an interview with the hiring manager, she gave me sage advice that I have never forgotten: Never burn bridges in the long term care industry. She went on to explain that the long term care industry is a very small industry and people know and/or know of each other. During the time I have been in healthcare, I have never forgotten this. Why? Because I have worked with the same people not only in different companies, but different sectors and even different states. When an author comes out in support of another author’s bad behavior, people who are critical to the success of the author are not only watching; they are taking names. Initially, I found myself become deeply saddened and beaten down when I saw a prominent small publishing executive and author not only come out in support of Ms. Hale, but refer to critical reviewers as the Taliban. As I reflected on it during the day, my sadness turned to anger. I found this woman, who is a popular author, to be incredibly selfish. This is a woman who is a successful author. She has made it. Yet her behaviors and comments basically condoning Ms. Hale’s behaviors hurt the authors who haven’t. 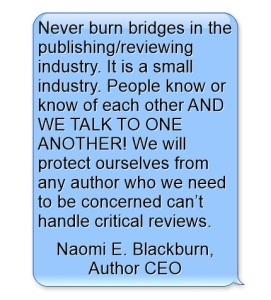 She didn’t care how her comments would reflect on the indie sector, in general, but, in particular, the authors who must reach out and work daily with these reviewers who are a critical components to the author’s marketing plan. This includes authors that she represents as an executive of a small publishing house. She has shown herself to be overly emotional, short on insight and, as an executive, demonstrated the professionalism of a gnat. Shame on her. Second, a reputation for being a badly behaving author can work its way around social media, particularly Goodreads. There is nothing worse for an author than to have a reputation for being thin skinned. 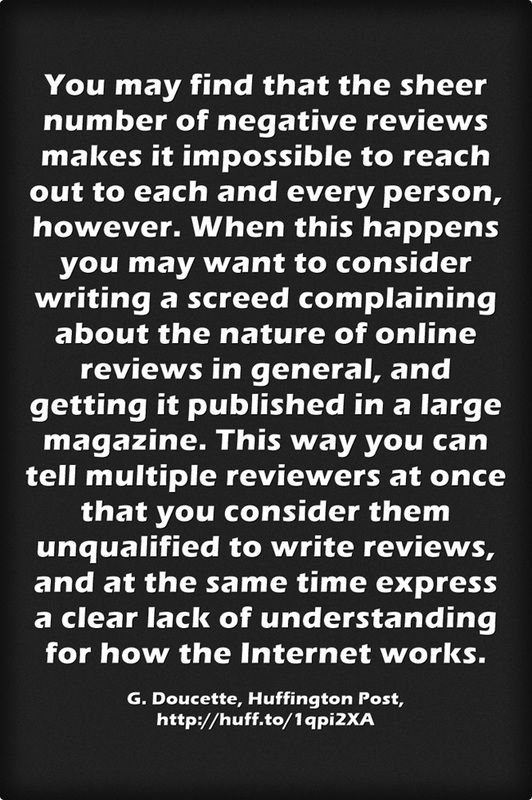 For example, we see lists pop up all the time on Goodreads for authors who argue with negative reviewers. Within days of Kathleen Hale’s incident, I was sent a link for a list that had been developed on authors who supported Ms. Hale’s stalking. Every book that these authors wrote were put on this list. Is this unusual behavior? No. There are lists with authors behaving badly for readers to avoid. Next time you find yourself even remotely thinking about responding emotionally to a negative review or coming out in support of someone who has, think of the long term consequences to a short term reaction. Otherwise, it might cost ya! Hell, it might even become the subject of a blog train! Great points, Naomi! 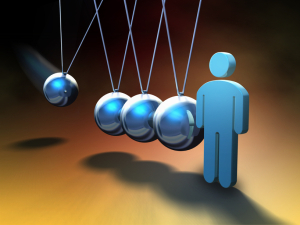 Civility and kindness are not only good for each of us – but for the industry. I especially love your point about never burning bridges. My uncle used to have a slightly saltier version of the same point: never spit in the wind, because, chances are, it will come back in your face. 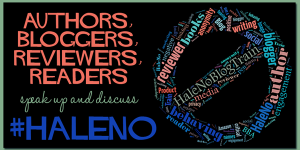 Thank you so much for this post – and for all your work on behalf of all indie authors! I always try to be the consummate professional, Ter! OK…stop laughing. If I may? A correction of fact. Hale did not stalk “a negative book reviewer.” Hale stalked a book reviewer who wrote a negative review of Hale’s book. There is a marked difference, and it’s clear that the reviewer wrote far more positive than negative reviews before reading and reviewing Hale’s book. Great point AND I agree with you. I came from the “negative book reviewer” comment from the stance of those who posted in support of Hale’s behavior called it. 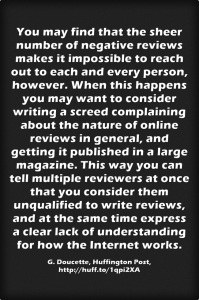 By no means do I agree with the reviewer being a negative reviewer. Thanks for your comment. You have such a great sense of humor, Naomi! One of the many things I love about you! You really ARE the consummate professional!! As always, you are the voice of reason, my friend. Being an author on the receiving end of 1-stars, I do what I recommend all authors do: read them, learn from them, and keep writing. I have thanked many readers and reviewers for their reviews — be it one-star or five stars. I’m grateful they have spent the time and effort on my work at all! As for Hale, I have seen it suggested that she’s doing this for publicity. Perhaps. Though I would imagine people might tend to be more critical given her behavior. Thanks Rachel. I think what scares me most out of all of this are those authors who come out in support of the offending author. It can be written off to say “Ms. Hale maybe has some mental health issues that caused her to do what she did.” Done. However, when you see a large number of authors come out in support of her INCLUDING a publishing executive…it gives pause. I think what happened with this occurring with Ms. Hale, a traditionally published author (and Anne Rice supporting her), is that we say that this isn’t a sector problem. This is an industry problem that needs to be addressed and quickly. If you look on Kathleen Hale’s Facebook page, there is no mention of this article or anyone responding back. Not sure if she’s deleted posts in relation to this incident or not. But everything on her page smacks of business as usual. I couldn’t find another author page for her, just her personal profile page. I’m surprised she’s not responding back, even in a polite way about it, or mentioning it in some way. I’d be really curious to know how her publisher addressed this. If I were a publisher and one of my authors did this, I’d threaten to pull a contract. That’s just me. Sorry I missed this, Scarlet. My guess is that the publisher did reign her in. I am very slightly reminded of the Chelsea Cain incident where she went off on her fans and the publisher’s response and oversight including the significant dropping of the price of CC’s book.. This incident makes Chelsea Cain look like a girl scout. Oh, yes! The Chelsea Cain incident! I do remember that. People were PO’d big time. You know what, Anne Rice frequently re-answers questions on her FB page. I know people have horror stories about her, but I do like her. As I said in my post on my FB page: I’d LOVE for anybody to comment on my blog or FB page. It would be nice to have people interested in you enough to care and ask questions. I’m not too familiar with the incident, but I will say that everyone, everywhere is subject to criticism when you’re in the arts. Social media has given everyone a voice – so if you’re going to benefit from it on the positive side, you can expect it on the negative side too.